Pesticides can be good for the environment! We are told constantly that pesticides harm humans and the environment - is this really true? I believe that that human activity, especially extensive agriculture, harms the environment most (and of course we all want to go on eating). Many of the key issues in the debate can be summarised in an exchange between Prof A. Trewavas and Lord P. Melchett, and published by a major supermarket with a commercial interest in the issues. Amongst many others, Trewavas [(March 2001). "Urban myths of organic farming". Nature 410: 409-410.] contests the notion that organic agricultural systems are more friendly to the environment and more sustainable than high-yielding farming systems. In particular, are we asking the right questions about organic agriculture - which is so often presented as a viable alternative. Why is organic produce more expensive, if it requires fewer inputs? How much land does it take up (compared with conventional growing)? Does composting, manuring, etc. 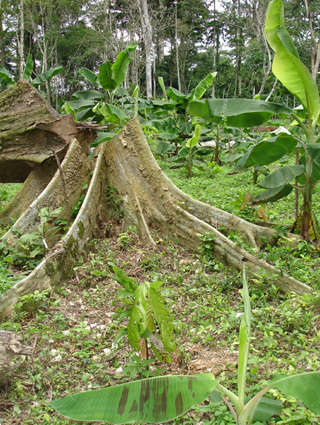 really provide a long-term solution to soil fertility - especially in tropical climates? How much do you know about the 'natural solutions' (e.g. nicotine, copper) used to control plant pests and diseases? The DROPDATA pages describe our work on rational pesticide use, especially better application to minimise pesticide use by spraying more efficiently. Surely, by making agriculture more efficient, we can relieve pressure on the land and help provide more sustainable livelihoods for farmers and their families. Pesticide regulations in the European Union continue to undergo amendment (e.g. the Annexes II, III and IV specified under Regulation 149/2008/EEC). The original 91/414/EEC regulation was seen by many as just the start of a review process and in July 2008 EU agriculture ministers approved even stricter controls, with a shift in emphasis from risk to hazard-based assessment - latest here. invasive alien weeds (e.g. Chromolaena odorata and Mimosa pigra). Our sponsors and colleagues have provided funding and information in order to promote international development and good agricultural / pest management practices. The views and recommendations expressed here are given in the spirit of free exchange of information and ideas. Whereas every care has been taken to ensure accuracy throughout, we cannot take any legal responsibility for any errors or omissions on these web pages. However, we would of course welcome any comments and suggestions and would always attempt to correct any errors as speedily as possible.